Definition at line 84 of file llcallingcard.h. Definition at line 115 of file llcallingcard.h. Definition at line 181 of file llcallingcard.h. Definition at line 123 of file llcallingcard.cpp. Definition at line 132 of file llcallingcard.cpp. References deleteTrackingData(), mBuddyInfo, and mObservers. Definition at line 265 of file llcallingcard.cpp. References LLFriendObserver::ADD, DB_FIRST_NAME_BUF_SIZE, DB_LAST_NAME_BUF_SIZE, first, gCacheName, LLCacheName::getName(), LLRelationship::getRightsGrantedTo(), LLRelationship::isOnline(), lldebugs, llendl, llwarns, mBuddyInfo, mModifyMask, and notifyObservers(). Definition at line 477 of file llcallingcard.cpp. Referenced by LLCallingCardBridge::LLCallingCardBridge(), LLIMMgr::LLIMMgr(), LLPanelFriends::LLPanelFriends(), LLFloaterWorldMap::observeFriends(), and LLAgent::observeFriends(). Definition at line 544 of file llcallingcard.cpp. References LLTrackingData::agentFound(), instance(), mTrackingData, and setTrackedAgentValid(). Definition at line 504 of file llcallingcard.cpp. References end, f, and mBuddyInfo. Referenced by LLFloaterWorldMap::buildAvatarIDList(), LLAgent::friendsChanged(), and LLPanelFriends::refreshNames(). Definition at line 306 of file llcallingcard.cpp. Definition at line 454 of file llcallingcard.cpp. Referenced by processNotify(), track(), untrack(), and ~LLAvatarTracker(). Definition at line 389 of file llcallingcard.cpp. Definition at line 399 of file llcallingcard.cpp. Definition at line 460 of file llcallingcard.cpp. References _PREHASH_AgentBlock, _PREHASH_FindAgent, _PREHASH_GlobalX, _PREHASH_GlobalY, _PREHASH_Hunter, _PREHASH_LocationBlock, _PREHASH_Prey, _PREHASH_SpaceIP, LLMessageSystem::addF64Fast(), LLMessageSystem::addU32Fast(), LLMessageSystem::addUUIDFast(), gAgent, gAgentID, gMessageSystem, LLUUID::isNull(), LLTrackingData::mAvatarID, mTrackingData, LLMessageSystem::newMessageFast(), LLMessageSystem::nextBlockFast(), and LLAgent::sendReliableMessage(). Referenced by LLTrackingData::haveTrackingInfo(), and track(). Definition at line 684 of file llcallingcard.cpp. References LLFriendObserver::ADD, get_ptr_in_map(), LLRelationship::GRANT_ONLINE_STATUS, instance(), mBuddyInfo, mModifyMask, and notifyObservers(). Referenced by friendship_offer_callback(), and process_improved_im(). Definition at line 253 of file llcallingcard.cpp. References LLTrackingData::mAvatarID, mTrackingData, and LLUUID::null. Referenced by LLFloaterWorldMap::onAvatarComboPrearrange(), LLTracker::render3D(), and LLTracker::stopTrackingAvatar(). Definition at line 335 of file llcallingcard.cpp. References get_ptr_in_map(), mBuddyInfo, and NULL. Referenced by LLPanelFriends::addFriend(), LLPanelFriends::applyRightsToFriends(), deliver_message(), LLPanelFriends::handleRemove(), LLIMMgr::noteOfflineUsers(), LLPanelFriends::onClickIM(), processNotify(), LLPanelFriends::refreshRightsChangeList(), LLTracker::render3D(), and LLPanelAvatar::setAvatarID(). Definition at line 217 of file llcallingcard.cpp. References LLViewerObjectList::findObject(), gAgent, LLAgent::getPositionGlobal(), LLViewerObject::getPositionGlobal(), gObjectList, LLViewerObject::isDead(), LLTrackingData::mAvatarID, LLVector3d::mdV, LLTrackingData::mGlobalPositionEstimate, mTrackingData, RAD_TO_DEG, VX, VY, and VZ. Definition at line 194 of file llcallingcard.cpp. 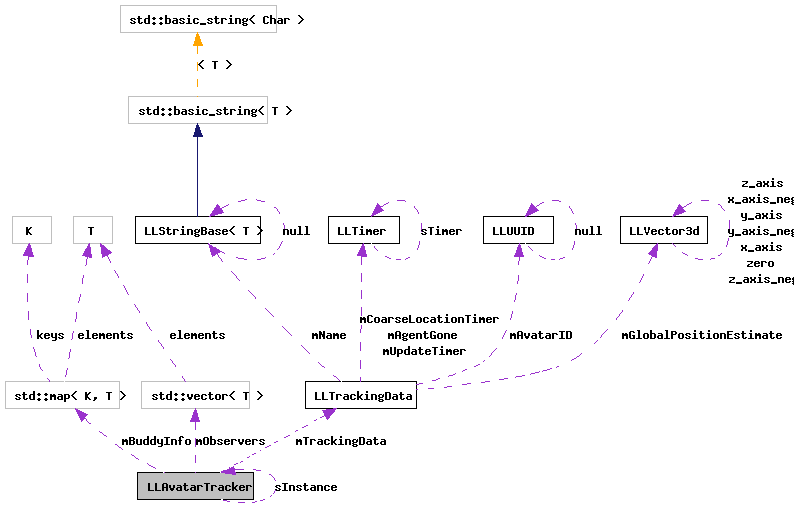 References LLViewerObjectList::findObject(), LLViewerObject::getPositionGlobal(), gObjectList, LLViewerObject::isDead(), LLTrackingData::mAvatarID, LLVector3d::mdV, LLTrackingData::mGlobalPositionEstimate, mTrackedAgentValid, mTrackingData, and VZ. Referenced by LLTracker::getTrackedPositionGlobal(), LLTracker::render3D(), LLFloaterWorldMap::teleport(), and LLFloaterWorldMap::teleportToAvatar(). Definition at line 241 of file llcallingcard.cpp. References LLTrackingData::mName, mTrackingData, and LLStringBase< char >::null. Definition at line 185 of file llcallingcard.cpp. Definition at line 87 of file llcallingcard.h. Referenced by LLPanelFriends::addFriend(), agentFound(), LLPanelFriends::applyRightsToFriends(), LLFloaterWorldMap::buildAvatarIDList(), LLCallingCardBridge::buildContextMenu(), LLIMMgr::defaultIMTypeForAgent(), deliver_message(), LLWorldMapView::draw(), LLNetMap::draw(), LLTracker::drawHUDArrow(), LLFloaterWorldMap::flyToAvatar(), formFriendship(), LLFloaterWorldMap::friendsChanged(), LLAgent::friendsChanged(), LLCallingCardBridge::getIcon(), LLCallingCardBridge::getLabelSuffix(), LLTracker::getTrackedPositionGlobal(), handle_track_avatar(), LLBeginIMSession::handleEvent(), LLPanelFriends::handleRemove(), LLTrackingData::haveTrackingInfo(), idle_startup(), LLIMMgr::inviteToSession(), is_agent_friend(), is_agent_mappable(), LLCallingCardBridge::LLCallingCardBridge(), LLIMMgr::LLIMMgr(), LLPanelFriends::LLPanelFriends(), LLIMMgr::noteOfflineUsers(), LLFloaterWorldMap::observeFriends(), LLAgent::observeFriends(), LLFloaterWorldMap::onAvatarComboPrearrange(), LLPanelFriends::onClickIM(), LLPanelFriends::onClickProfile(), LLCallingCardBridge::openItem(), CoarseLocationUpdate::post(), processAgentFound(), processChangeUserRights(), processNotify(), processOfflineNotification(), processOnlineNotification(), processTerminateFriendship(), LLPanelFriends::refreshNames(), LLPanelFriends::refreshRightsChangeList(), LLTracker::render3D(), LLPanelAvatar::setAvatarID(), LLPanelAvatar::setOnlineStatus(), LLTracker::stopTrackingAvatar(), LLFloaterWorldMap::teleport(), LLFloaterWorldMap::teleportToAvatar(), LLTracker::trackAvatar(), LLViewerRegion::updateCoarseLocations(), LLCallingCardBridge::~LLCallingCardBridge(), LLIMMgr::~LLIMMgr(), and LLPanelFriends::~LLPanelFriends(). Definition at line 379 of file llcallingcard.cpp. References get_ptr_in_map(), LLRelationship::GRANT_MODIFY_OBJECTS, LLRelationship::isRightGrantedTo(), and mBuddyInfo. Definition at line 358 of file llcallingcard.cpp. References get_ptr_in_map(), LLRelationship::isOnline(), and mBuddyInfo. Referenced by LLCallingCardBridge::buildContextMenu(), LLCallingCardBridge::getIcon(), LLBeginIMSession::handleEvent(), LLPanelFriends::onClickProfile(), and LLCallingCardBridge::openItem(). Definition at line 91 of file llcallingcard.h. Definition at line 492 of file llcallingcard.cpp. References end, mModifyMask, mObservers, and LLFriendObserver::NONE. Referenced by addBuddyList(), formFriendship(), LLPanelFriends::handleRemove(), processChange(), processNotify(), and processTerminateFriendship(). Definition at line 528 of file llcallingcard.cpp. References _PREHASH_AgentBlock, _PREHASH_GlobalX, _PREHASH_GlobalY, _PREHASH_Hunter, _PREHASH_LocationBlock, _PREHASH_Prey, agentFound(), LLMessageSystem::getF64Fast(), LLMessageSystem::getUUIDFast(), instance(), LLVector3d::mdV, VX, and VY. Definition at line 568 of file llcallingcard.cpp. References _PREHASH_AgentData, _PREHASH_AgentID, _PREHASH_AgentRelated, _PREHASH_RelatedRights, _PREHASH_Rights, LLViewerWindow::alertXml(), count, DB_FIRST_NAME_BUF_SIZE, DB_LAST_NAME_BUF_SIZE, first, gAgent, gCacheName, LLAgent::getID(), LLCacheName::getName(), LLMessageSystem::getNumberOfBlocksFast(), LLMessageSystem::getS32Fast(), LLMessageSystem::getUUIDFast(), LLRelationship::GRANT_MODIFY_OBJECTS, gViewerWindow, i, mBuddyInfo, mModifyMask, notifyObservers(), LLFriendObserver::POWERS, and S32. Definition at line 617 of file llcallingcard.cpp. References instance(), lldebugs, llendl, and processChange(). Definition at line 623 of file llcallingcard.cpp. References _PREHASH_AgentBlock, _PREHASH_AgentID, LLInventoryModel::addChangedMask(), LLInventoryObserver::CALLING_CARD, count, DB_FIRST_NAME_BUF_SIZE, DB_LAST_NAME_BUF_SIZE, deleteTrackingData(), FALSE, first, gCacheName, LLControlGroup::getBOOL(), getBuddyInfo(), LLCacheName::getName(), LLMessageSystem::getNumberOfBlocksFast(), LLMessageSystem::getUUIDFast(), gInventory, gSavedSettings, i, instance(), lldebugs, llendl, llwarns, LLTrackingData::mAvatarID, mModifyMask, mTrackingData, LLInventoryModel::notifyObservers(), notifyObservers(), LLUUID::null, NULL, LLFriendObserver::ONLINE, S32, setBuddyOnline(), LLNotifyBox::showXml(), and TRUE. Referenced by processOfflineNotification(), and processOnlineNotification(). Definition at line 562 of file llcallingcard.cpp. References instance(), lldebugs, llendl, and processNotify(). Definition at line 555 of file llcallingcard.cpp. Definition at line 702 of file llcallingcard.cpp. References get_ptr_in_map(), LLMessageSystem::getUUID(), instance(), mBuddyInfo, mModifyMask, notifyObservers(), and LLFriendObserver::REMOVE. Definition at line 514 of file llcallingcard.cpp. References _PREHASH_ChangeUserRights, _PREHASH_FindAgent, _PREHASH_OfflineNotification, _PREHASH_OnlineNotification, processAgentFound(), processChangeUserRights(), processOfflineNotification(), processOnlineNotification(), processTerminateFriendship(), LLMessageSystem::setHandlerFunc(), and LLMessageSystem::setHandlerFuncFast(). Definition at line 485 of file llcallingcard.cpp. Referenced by LLCallingCardBridge::~LLCallingCardBridge(), LLIMMgr::~LLIMMgr(), and LLPanelFriends::~LLPanelFriends(). Definition at line 369 of file llcallingcard.cpp. References get_ptr_in_map(), LLRelationship::GRANT_MODIFY_OBJECTS, LLRelationship::grantRights(), mBuddyInfo, mModifyMask, and LLFriendObserver::POWERS. Definition at line 342 of file llcallingcard.cpp. References get_ptr_in_map(), lldebugs, llendl, llwarns, mBuddyInfo, mModifyMask, LLFriendObserver::ONLINE, and LLRelationship::online(). Definition at line 92 of file llcallingcard.h. Definition at line 177 of file llcallingcard.cpp. Referenced by CoarseLocationUpdate::post(), and LLViewerRegion::updateCoarseLocations(). Definition at line 316 of file llcallingcard.cpp. References LLMessageSystem::addUUID(), gAgent, get_ptr_in_map(), LLAgent::getID(), LLAgent::getSessionID(), gMessageSystem, lldebugs, llendl, mBuddyInfo, mModifyMask, LLMessageSystem::newMessage(), LLMessageSystem::nextBlock(), LLFriendObserver::REMOVE, and LLAgent::sendReliableMessage(). Definition at line 139 of file llcallingcard.cpp. References _PREHASH_AgentData, _PREHASH_AgentID, _PREHASH_PreyID, _PREHASH_SessionID, _PREHASH_TargetData, _PREHASH_TrackAgent, deleteTrackingData(), findAgent(), gAgent, LLAgent::getID(), LLAgent::getSessionID(), gMessageSystem, mTrackedAgentValid, mTrackingData, LLMessageSystem::newMessageFast(), LLUUID::notNull(), and LLAgent::sendReliableMessage(). Referenced by handle_track_avatar(), and LLTracker::trackAvatar(). Definition at line 160 of file llcallingcard.cpp. References _PREHASH_AgentData, _PREHASH_AgentID, _PREHASH_PreyID, _PREHASH_SessionID, _PREHASH_TargetData, _PREHASH_TrackAgent, LLMessageSystem::addUUIDFast(), deleteTrackingData(), gAgent, LLAgent::getID(), LLAgent::getSessionID(), gMessageSystem, LLTrackingData::mAvatarID, mTrackedAgentValid, mTrackingData, LLMessageSystem::newMessageFast(), LLMessageSystem::nextBlockFast(), LLUUID::null, and LLAgent::sendReliableMessage(). Definition at line 179 of file llcallingcard.h. Referenced by addBuddyList(), applyFunctor(), copyBuddyList(), formFriendship(), getBuddyInfo(), isBuddyEmpowered(), isBuddyOnline(), processChange(), processTerminateFriendship(), setBuddyEmpowered(), setBuddyOnline(), terminateBuddy(), and ~LLAvatarTracker(). Definition at line 175 of file llcallingcard.h. Referenced by addBuddyList(), formFriendship(), notifyObservers(), processChange(), processNotify(), processTerminateFriendship(), setBuddyEmpowered(), setBuddyOnline(), and terminateBuddy(). Definition at line 182 of file llcallingcard.h. Referenced by addObserver(), notifyObservers(), removeObserver(), and ~LLAvatarTracker(). Definition at line 174 of file llcallingcard.h. Referenced by getGlobalPos(), isTrackedAgentValid(), setTrackedAgentValid(), track(), and untrack(). Definition at line 173 of file llcallingcard.h. Referenced by agentFound(), deleteTrackingData(), findAgent(), getAvatarID(), getDegreesAndDist(), getGlobalPos(), getName(), haveTrackingInfo(), processNotify(), setTrackedCoarseLocation(), track(), and untrack(). Definition at line 172 of file llcallingcard.h.